Lynda Freeman’s Upper Beach kitchen may seem like an ordinary kitchen at first glance, but it eventually becomes apparent that this humble room, with its huge table, easels stacked in one corner, three cats and one tireless little dog coming and going, and eastern wall composed mostly of window, is actually a hub of artistic energy. Freeman is showing Beach Metro News the pieces she plans to exhibit in the Beach Guild of Fine Art’s Small Paintings for Small Spaces show – four floral pieces in oil pastel – in between rounds of throwing a rubber chew toy for a puppy. The floral works are a bit of a departure for her, something inspired by travelling light to San Miguel de Allende in Mexico recently, a town she visits occasionally and has taught art classes in. 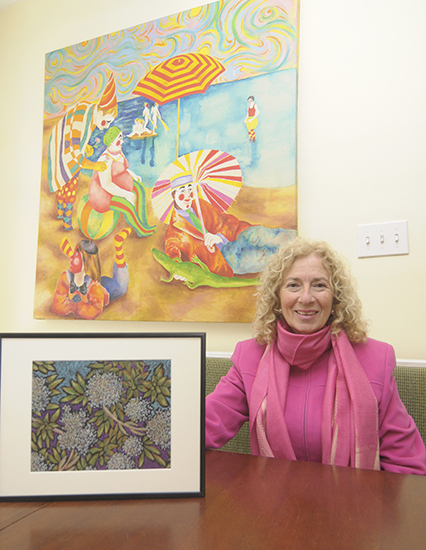 Painter Lynda Freeman shows off one of the works she will exhibit at the Beach Guild of Fine Art’s Small Paintings for Small Spaces show. Another is shown below. The oil pastel drawings point in a different direction than her usual figurative work, such as the painting on the wall of her Upper Beach kitchen studio, above. She opted not to deal with the hassle of packing brushes, tubes of paint and canvas. “So I just took a box of oil pastels and some black paper,” she says. Does she prefer to travel for artistic inspiration? “I prefer to travel for all kinds of reasons,” she says with a smile. While the oil pastels were a successful excursion, Freeman said she usually prefers to work in acrylics, usually at a much larger scale. She also tends to paint people rather than flora, fauna or landscapes. “I actually like to do figurative work, but I like to do it in a more whimsical way,” she says, with a large painting involving several clowns on a beach hanging on the wall behind her. Freeman trained first at New York’s Pratt Institute, before finishing her BA at York University. A retired elementary teacher, she can’t seem to kick the school bug – she teaches classes of up to five adult painting students two or three times a week in her kitchen/studio, a focus of artistic energy not just for her, but for eager learners. Students gather in the kitchen, set up their equipment, turn on the radio, put on the kettle and get to work, with that wall of light coming in the whole time. She’s also taken inspiration from the current Francis Bacon/Henry Moore exhibit at the Art Gallery of Ontario, though she is the first to admit she has a weakness for art museums in general. “In every city I visit, I hit the ground running towards their art museums,” she says. Freeman hasn’t always been only a painter. At one point she was working with clay, making masks. “Craft is not on a lower level of creativity than art to me,” she says. At one point, that work earned her an invitation to Japan, as part of a group of 10 international artists contributing designs to a series of plates. Artists were hosted by local families, and Freeman has fond memories of attempting to talk with a family that spoke no English, matched with her total lack of Japanese. “We communicated through two dictionaries,” she says with a laugh. Freeman will have four works featured at the Small Paintings for Small Spaces show, which runs from 3 to 8 p.m. on Friday, May 23, and from 10 a.m. to 5 p.m. on Saturday, May 24 and Sunday, May 25 at the Gardener’s Cottage near the foot of Kew Gardens on Lee Avenue. The show features about 140 paintings by more than 35 artists from the Guild (beachguildoffineart.com), with all work priced under $350. Admission is free, and there will be a draw for a gift basket. Freeman will be painting on location on the boardwalk from noon to 2:30 p.m. on the Saturday, weather permitting. Freeman is also a member of the Don Valley Art Club, which has a show at the Papermill Gallery at Todmorden Mills, at the bottom of Pottery Road, until May 18.